There’s a massive distortion in the labor market for physicians right now because of federal student loan policy. If you haven’t heard, the Public Service Loan Forgiveness program (PSLF) is the biggest back door scholarship program in the nation’s history, and physicians are uniquely positioned to receive the windfall from this program. PSLF distorts physician salaries enormously, yet the lack of widespread understanding how the program works has delayed the impact on the physician labor force. 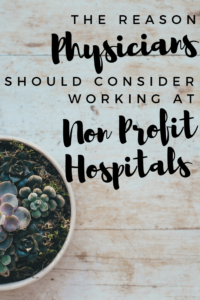 I fully expect PSLF to be front and center in every employment negotiation between a physician and a not for profit hospital system for the next 10 years at least as residents and fellows learn how to optimize their med school loans. Headhunters looking for physicians for private practices will face far higher salary requirements to pull doctors away from PSLF qualifying employment. I fully believe we’re only about 2-3 years away from not for profit hospitals using PSLF as a primary recruiting tool. Let’s start with an example. Consider two doctors who went to medical school together and go to a pediatrics and neurosurgery residency respectively. Both leave owing $300,000 in debt at a 7% interest rate. We’ll assume each makes $60,000 a year in their PGY1 year, and that salary grows at an inflation rate of 3% for each year they’re in training. The pediatrics resident trains for three years and the neurosurgery resident trains for seven years. When they exit, we’ll assume that the pediatrician will earn $167,000 and the neurosurgeon will earn $680,000. Both salaries increase with inflation. What if both manage their student loans with the Pay As You Earn program (PAYE) and file the PSLF paperwork for 10 years? Let’s compare that to the cheapest option available in the for profit sector, which is private refinancing after residency. I’m assuming a 10 year fixed interest rate refinancing around 5%. It’s possible that the doctors could save money by choosing a more aggressive 5 year variable rate and paying it back as fast as possible. However, most folks will gradually repay their loans. So how much does medical school cost in both scenarios? So the top row represents the cost of medical school if the doctors went into private practice. 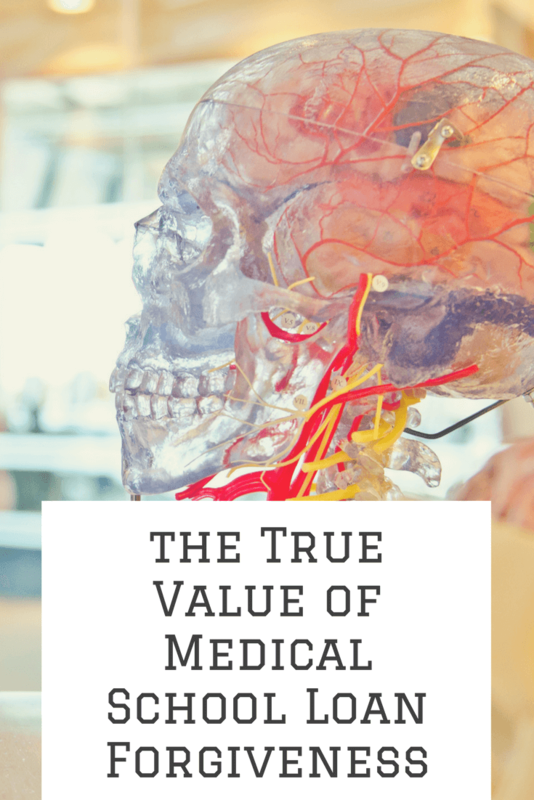 The neurosurgeon has a higher cost from this path because they have a longer training period during which interest accrues. The bottom row is the cost if the doctors worked in a not for profit hospital. 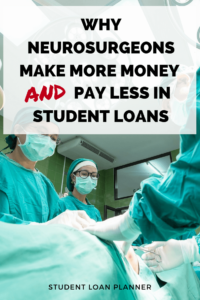 The neurosurgeon’s cost here is higher because they make much higher payments during the three years as an attending because of the higher salary. The PSLF dollar value has to be translated into a salary equivalent for each year the doctor has to work at a not for profit hospital to earn it. It is an after tax benefit, so it also must be adjusted for taxes. I’ll assume a 40% rate for that purpose later on. I calculated these numbers from my student loan calculator, which you can get for free here. So What is PSLF Worth to These Doctors Annually? Both doctors had to complete their training at a not for profit institution. Hence, they already have 3 and 7 years of credit towards PSLF at the end of their training respectively. Subtract both of these numbers from 10, and you have the number of years each doctor would have to spend at a hospital as an attending to qualify for PSLF. This is the salary distortion I was talking about. A neurosurgeon looking at private practice vs a not for profit hospital could add $163,000 to whatever he or she is getting paid and that’s the private practice equivalent salary. 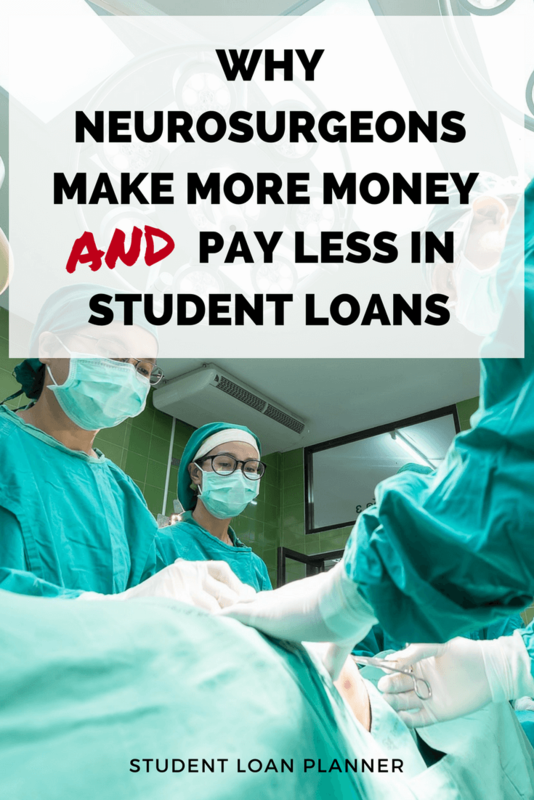 Keep in mind that a neurosurgeon could work for 3 years at a hospital to get experience and then leave and set up their own practice after their loans are forgiven. Hence, for most physicians, PSLF represents a relatively short term employment commitment. A pediatrician has a higher boost to their salary from PSLF relative to what they make. However, the pediatrician must work for 7 years as an attending to obtain the benefit compared to 3 for the neurosurgeon. That’s a big difference. What About Your Specialty? How Much Would PSLF Be Worth to You? I decided to undertake a fun little project. I looked up median salary information from the American Association of Medical Colleges. Additionally, I also looked up the training periods for a variety of specialties. Using this data, I can extrapolate that example of the pediatrician and neurosurgeon from earlier to all major specialties in medicine. To review, we’re assuming $300,000 in medical school loans at a 7% interest rate. These calculations are approximated, but they give a good idea on how to think about how much PSLF is worth. I’m assuming a marginal tax rate of 40%. Since student loan interest isn’t tax deductible, any savings from PSLF must be adjusted upwards to account for taxes. The column at the far right is what you’d need to add to a not for profit hospital salary to make the job equivalent with private practice. Here’s how to use the table above. Say you train 6 years to become a Gastroenterologist and just finished residency. You’re looking at two jobs. One pays $350,000 at a hospital. Another pays $400,000 at a private practice. If you have $300,000 in med school loans, take the corresponding figure above in the pre-tax PSLF salary column. We find that it’s $123,600. So let’s make it more approximate and say $120,000. Take that figure and add it to the hospital job. Now that salary is more like $470,000, which easily beats the private practice job. 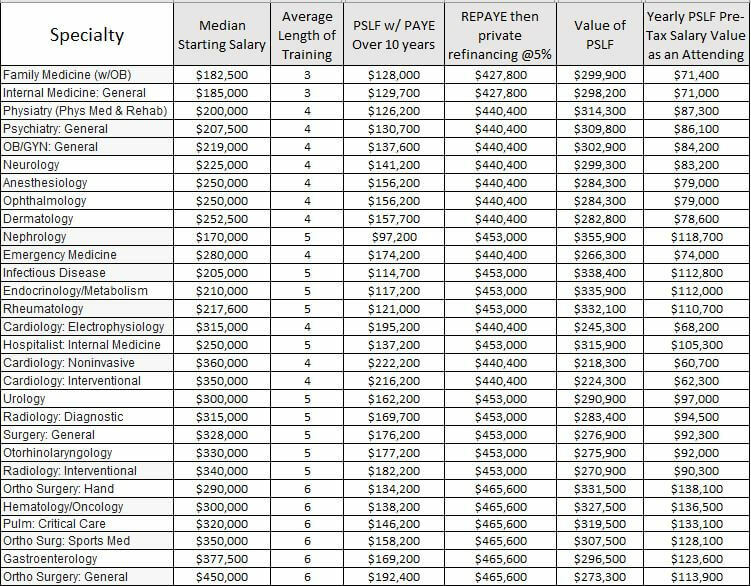 The above table shows that not for profit hospitals have become FAR more attractive places to work financially thanks to the PSLF program. Hospitals have not yet adjusted salaries to reflect this, but they will eventually do so. I also anticipate that as average medical school loans move higher, private practices will have a much harder time recruiting physicians. Go back to the neurosurgeon example from earlier. If you expanded your time in training to 10 years for a lengthy fellowship, you could pay as little as $30,000 for medical school because all your payments under PAYE would be on a low salary. That means you could start out at a much higher attending income and get the government to subsidize your education. Particularly for lower income specialties such as pediatrics or primary care, doing a fellowship is a great way to pick up more skills on the government’s dime. I hope your takeaway from this article is that figuring out the best way to repay med school loans can be complicated but picking a smart strategy can save you a ton of money. My fiancee consolidated her loans at the end of residency and lost 4 years of credit towards PSLF. That mistake cost us tens of thousands of dollars. Make sure you file the PSLF certification form during residency to track your progress. Then use the value of PSLF to choose a job. That is, assuming it still exists when you start looking for attending positions. I expect with about 80% to 90% certainty that it will exist for current borrowers. The only bad decision is not thinking about your med school loans. 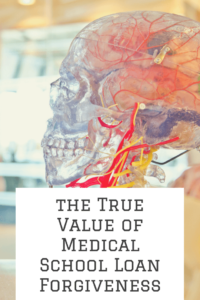 If you craft a strategy and know your options, you can drastically increase the return on investment from your medical education. If you have a six figure student loan burden from medical school, contact me to see what I can do for you. I help physicians conquer huge student loan balances with flat fee consultations. I perform a holistic loan analysis with my proprietary simulation tool to see what your best available repayment options are (government, private refinancing, etc). I’ve saved the average client tens of thousands of dollars. Click on the button below if you have a question for me. Both the pediatrician and the neurosurgeon will have salaries that exceed the PAYE monthly amount, making them revert monthly payments to the Standard Repayment Plan amount. Since the Standard Repayment Plan is not income driven, both will have to make the same exact monthly payments. However, the neurosurgeon will only be making these high payments for three years, while the pediatrician will have been making them for seven. This amplifies the disparity between the two even more. Good point if the loan balance was small like $150,000. However, say you’re looking at $300,000+. Most peds attendings are going to be paying between $1200-$1500 a month on PAYE, still not close to the max. That level of payments continues for 7 years. The neuro maybe has their 3 years of payments at $5000 per month based on the 10 year standard plan. So I could see it coming out to a wash in some cases. That said, the take home is that the neuro gets these low payments throughout training and the balance grows a lot, AND they get this great salary compared to primary care. If the goal of federal policy is to encourage primary care doctors, the PSLF program does a horrible job at doing that. A direct, easy to understand subsidy would make the most sense. Also, high paying specialties are one of the few grad programs today where the financial math allows the full loan burden to be repaid if it came to that. Can you re-explain what the columns represent in the large table? 2) PSLF w/ PAYE over 10yrs: Is this how much you would have paid in 10 years? 3) Yearly PSLF Pre-Tax Value as an Attending: What does this value really represent. How do you exactly come up with it? So where would you draw the line in determining what specialties would benefit over PSLF and those that would benefit more from private practice? All great questions Casey. The median just represents the average for all including private and academic jobs I believe. Yes the PAYE over 10 would be total PSLF payments on PAYE over the full 10 years. Then the pre tax yearly value is dependent on how many years you need to work as an attending. It’s basically how much you need to add to the salary of an academic attending to equal the salary of a private practice job. 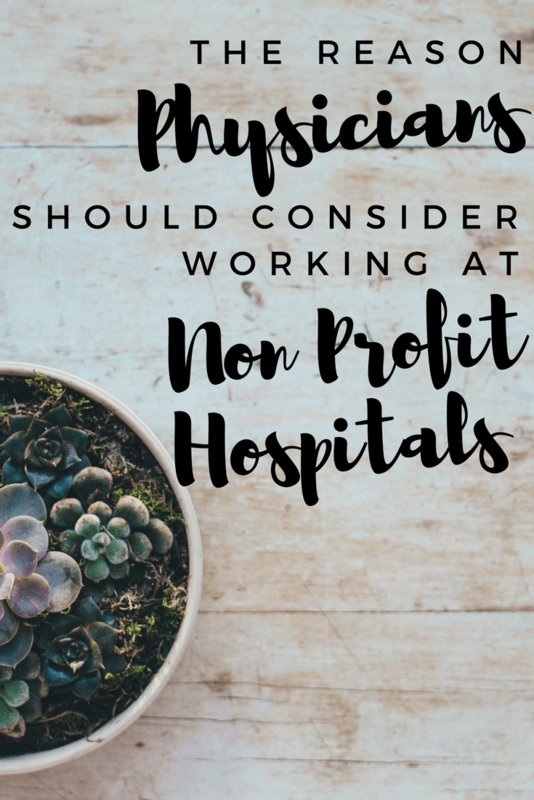 It’s higher for specialties that have longer training periods because you only have to spend 3-5 years as an attending at a 501c3 hospital, so the yearly value is higher because the period is shorter as a 501c3 attending. You should definitely be planning on PSLF. It doesn’t seem to be going anywhere even in our current environment. Hi Travis, do you know if any physicians have received loan forgiveness yet through the PSLF program? I know that they theoretically qualify, but I’m wondering if anyone has actually had their loans forgiven. Thanks in advance! I don’t personally know anyone yet no. I know for sure though that they’re trying to keep a low profile because they don’t want to be featured in the national media that they’re benefiting from this.